I mean, we knew that the Cavs had to be one of the closest teams in the NBA. And it isn't just this year, it's every year. LeBron James is like the glue to a team that is so close and so happy, it's infectious. 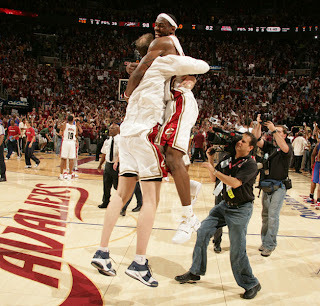 As shown in the famous LeBron-jumps-into-Z's-arms photo after Game 6 of that Detroit series. (That still brings a tear to my eye. A video of Shaq (poorly, but hilariously) lip-syncing to Rick Springfield's "Jesse's Girl" came out today, and it made me laugh out loud. Shaq is hilarious. And let's not forget Delonte's famous rap...Iced TEA!!!!! !